Spring is confused in Boston. For one thing it is just about constantly raining. I’m ready for the rain to stop so I can get out in the yard and fix everything that the rain screwed up and prepare things for planting. But instead we have a sunny day in the 70’s, then it drops to the 50’s and is cloudy, then rains for 3 more day and just when you think you can’t take it anymore is snows, but before you drink yourself stupid it’s back in the 70’s 2 days later. That’s New England for you. 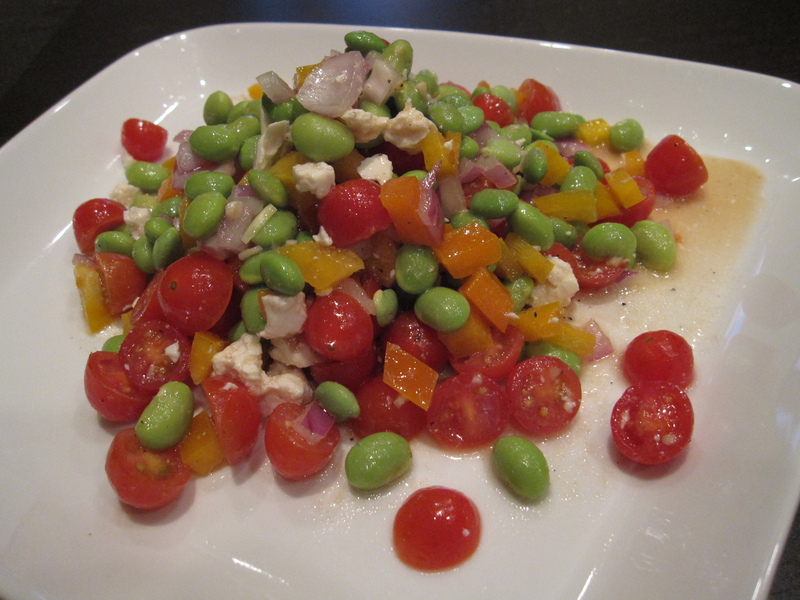 Well hoping to get things going in the right direction I made an edamame salad with dinner recently. Price and I live off salads like this in the summer. We mainly eat Horiatiki Salata throughout the summer but this might need to be added into the rotation. We used a 10oz package from Trader Joes, which was very convenient. I’d imagine that the frozen kind would work too, but I would let it thaw naturally or let cool before adding everything else. The dressing is done to taste. Adjust the quantities to taste. For example I love lemon and lime juice, which might be too much for someone else. The point is to have a starting point to create something that you will enjoy. In a large bowl, combine the chopped ingredients with the shelled edamame. Crumble the feta block into the vegetables. In a bowl, make the dressing by wisking the mustard and garlic with the vinegar and juice. Once the solids are completely incorporated add the oil. Gently mix together the salad with the dressing, and salt & pepper to taste.